Greetings! 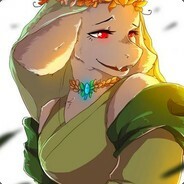 As you can see I am a big fan of Toriel. Feel free to add me if you want to play some TF2, Borderlands 2 or age of wonders 3, but make sure to check my infobox first and best leave a comment as well. Be aware that I don´t trade in general and that I am not a big fan of chat-roleplay. - I am not exactly picky with friend request, but I won´t accept if your name or picture seems insulting to me. Please make sure to leave a comment if we haven´t played before. can´t understand me (or the other way around). - If I am away or offline you shouldn´t expect a chat answer anytime soon, if I am busy I want to be left alone. - I won´t tolerate any sort of cancer-related joke. If I catch anyone on my friendlist doing them you will get blocked instantly. No exceptions. - Yes it´s my favorite game and possibly will ever be. - Don´t roleplay with me, especially in public chat. I srsly don´t like doing that. Talk to me like a normal person. - Don´t call me with nicknames like Goat Mom or anything mom-related. Calling me Tori is ok.
- My personal favorite Alternate Universe (of Undertale) is Storyshift, followed by: Inverted Fate, Undertale Parallel and Dreemurr Reborn. - I usually hang out in casual or mvm (mann up). - I rather dislike competitive mode, but play it with friends sometimes. - my favorite gamemodes: 5 CP, payload and attack/defend maps. - my least favorite gamemodes: KOTH and the custom gamemodes (except payload race, watergate and degroot keep). - The classes I play best are medic, engie and heavy. I also really like to play spy and sniper. - Call me a tryhard, but I really dislike friendlies in casual servers. Play the damm objective. - I also won´t play with braindead teams, so don´t be suprised if I leave when teammates get me killed or don´t support me in any way. - I dislike the Goblins, Draconians and the Halflings. - I can play pretty good as any class, though I don´t like sorcerer and necromancer that much. - finally, if you just started playing the game you might want to check out my AoW guides to give you an overview of each unit and class in the game. Check the according guides in the box below if interested. Regarding the lacking (even missing) tutorial, I recommend watching a Let´s play on youtube. I really learned a lot of things watching those videos. If you can´t find a good youtuber, I can recommend: the "Advanced strategy series" and the "Co-op strategy series" of the youtuber "blackarrowgaming"
All in all I give a recommendation for this game, to enjoy it in it´s full glory you have to get the 2 main DLCs however (add more races, a new class, new game mechanics and more). If you are willing to invest the time to get into the game, it´s worth even the full price (discount is better of course). I was getting rather bored of that match, not to mention kinda salty because of that blackbox + quickfix medic combo.